THC? CBD? CBN? We keeping hearing and reading about these acronyms, but what exactly are they? Here we break down the scientific explanations to offer easier-to-understand descriptions of three compounds popularly referred to in cannabis culture. The acronyms represent different cannabinoids extracted from the cannabis plant and used for different effects. Let’s go through these common terms used to describe various components of, and factors in, our favorite plant: cannabis. Whether we are inhaling, eating, drinking, lathering or soaking in cannabis products, it’s nice to know how and why they make us feel so good. … are certain chemical compounds found naturally in cannabis. There are about 500 compounds found in the cannabis plant, at least 85 of which are cannabinoids. Some cannabinoids have psychoactive properties, meaning they give us a “buzzed” or “high” feeling, while others do not. The active compounds are diverse in their look, function and purpose. Cannabinoids are also sometimes called phyto-cannabinoids or exo-cannabinoids. 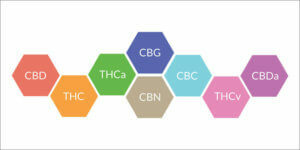 Below are descriptions of the three most common cannabinoids referred to in discussion and content labeling of cannabis products: THC, CBD and CBN. Technically all three of these cannabinoids are considered psychoactive; however there is a clear difference in the strength of the “high” feelings caused by each, and some are known to provide us with health benefits. … is the acronym for tetrahydrocannabinol, which is the most well known of the cannabis compounds. THC stimulates the section of the brain that causes the release of dopamine; this means, simply, that THC affects perception, mood, and behavior and is the source of the “high” we feel after ingesting cannabis products. The higher the level or dosage of THC, the stronger the high you experience. It is important to note that in addition to the psychoactive effects THC offers, this cannabinoid also has anti-inflammatory and therapeutic benefits (for pain relief). There is also evidence of THC-A (the acidic kind of THC) fighting cancer cells, specifically prostate cancer. Pharmacologists are conducting research on THC and other cannabinoids to better understand best uses, benefits, effects and medicinal properties of the cannabis plant. For newer users, it is important to begin your cannabis experience with a low dose of THC (5mg or less) to figure out your individual preference. … this is perhaps the second most popular cannabinoid and you’ve probably been hearing more about CBD and seeing products with higher doses, either together with THC or on its own. The acronym stands for cannabidiol and it is used more medicinally than THC, as it is not psychoactive (rather than stimulating you emotionally like THC, CBD calms you down and alleviates anxiety and pain). In the U.S. today, where we are battling an opioid and prescription pill epidemic, CBD is becoming increasingly popular as a natural alternative medicine. CBD is known for providing relief from arthritis, migraines, epilepsy, schizophrenia, muscle and joint aches. Furthermore, scientists are researching even more benefits of CBD, namely in the prevention and treatment of certain cancers and heart disease. Whereas once THC was the main and often sole compound noted in the quality of cannabis strains, now it has become more mainstream to see a variety of CBD-rich strains and products containing mostly, if not all, CBD. … is short for cannabinol, which does have psychoactive properties, although less so than THC. This cannabinoid is created by an oxidation process also involving THC and it comes from cannabigerolic acid. When a cannabis strain contains a large amount of CBN it can cause feelings of grogginess. CBN is described as acting similar to a sedative and it can be combined with THC to help reduce the feeling of anxiety, sometimes exacerbated by high levels of THC. In addition to lowering anxiety, CBN is also used for relieving muscle spasms, reducing sinus and behind-the-eyes pressure, and has been noted to promote deep and restful sleep. As mentioned previously, there are many more cannabinoids that exist in the cannabis plant. Each cannabinoid offers its own distinct effects and benefits, which are being studied as you read this. THCA, THCV, CBC, CBDA, CBDV are a few more acronyms for compounds that exist but are not yet as well known or utilized in cannabis culture. So why are these cannabinoids important? How do they affect our health and bodily systems? You may be surprised to learn that your body creates its own cannabinoids (similar to, but not exactly the same as those found in the cannabis plant,) in what’s called the endocannabinoid system — ECS for short. Yes, this system manages your emotions, sleep and appetite. What is so fascinating about the cannabinoids found in cannabis is that they activate certain cannabinoid receptors found naturally in our bodies. These receptors are in our immune systems, central nervous systems, and other parts of our bodies. When discussing the chemical compounds in cannabis and their effects on us, we are referring to two different types of our bodies’ receptors, CB1 (in the immune system) and CB2 (in the brain, nerve endings and nervous system). Specific cannabinoids from cannabis engage the cannabinoid receptors in our bodies. For example, when we ingest marijuana, THC activates the CB1 receptors in our brains, causing us to feel a head high. Similarly, CBN affects our CB2 receptors, causing us to feel physical relief. Therefore, depending on the active compounds in your cannabis strain (which should always be denoted on labels) you are able to curate your own experience and receive particular benefits. As more research is conducted and studies uncover further details of medicinal uses and advantages of cannabis and its individual cannabinoids, more Americans may have access to the natural products and treatments to lead happier and healthier lives.